Normal sight includes central vision (the field of view straight ahead) and peripheral vision (the field of view outside the circle of central vision). The inability to see within a normal range of view often indicates peripheral vision loss. In severe cases of peripheral vision loss, individuals only see with their central vision, which causes the sensation of looking through a narrow tunnel. For this reason, peripheral vision loss is sometimes referred to as tunnel vision. The primary symptom of peripheral vision loss is tunnel vision. When this symptom occurs, you are only able to see a small circle straight ahead. You may also have difficulty seeing in low light and have trouble walking. Peripheral vision loss does not always occur rapidly. As a result, many sufferers do not immediately realize they are experiencing a loss of peripheral vision, and do not receive diagnosis until examined by an eye care professional. Several conditions cause peripheral vision loss. Some conditions are serious and require immediate treatment, while others will simply clear up on their own. Any loss of vision or change in sight, however, should prompt an immediate examination by an eye care professional to rule out or begin treatment for any serious medical conditions. 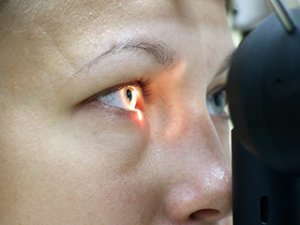 Conditions which cause peripheral vision and require medical treatment include glaucoma, damage to the retina, detached retina, retinitis pigmentosa, brain damage due to stroke or loss of blood, occlusions (eye strokes), optic nerve damage, optic neuritis, compressed optic nerve head, and concussions or other head injuries. In addition to these conditions which can lead to permanent vision loss, some factors cause temporary tunnel vision and may not require medical treatment. These include alcohol and drug use, high levels of adrenalin, extreme stress, panic, and anger. Peripheral vision loss due to these factors will clear up on its own with no treatment. Eye care professionals diagnose peripheral vision loss by using a field of vision exam to test your range of vision. If peripheral vision loss is detected, the eye care professional will determine the specific cause by performing further medical testing, observation, and by looking at your medical records. Once an underlying cause is determined, an eye care professional will recommend the treatment options. Depending on the cause, this might include surgery, medication, or vision therapy.